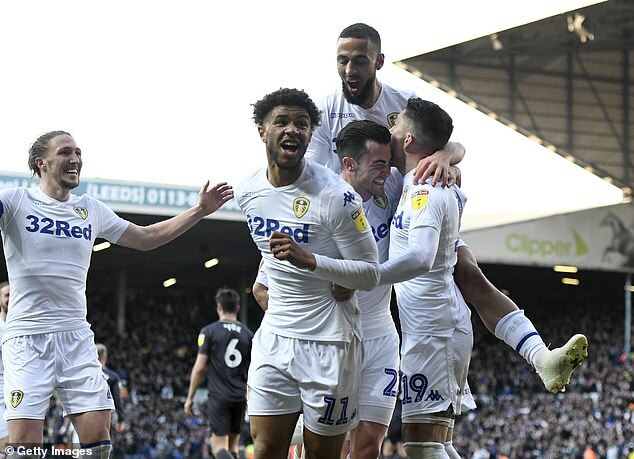 This felt like a pivotal moment in the race for automatic promotion to the Premier League even though Leeds coach Marcelo Bielsa played down the position his team found themselves in at the end of an electric evening at Elland Road. For more than an hour, an inspired goalkeeping display from Keiren Westwood under siege from wave after wave of attacks appeared set to frustrate a Leeds team that have exchanged second place with Sheffield United over the past month. 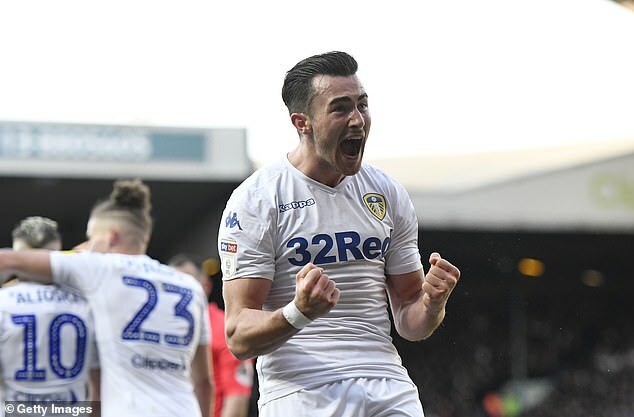 The dam finally burst, however, when Pablo Hernandez teased the ball in from the right and Manchester City loanee Jack Harrison applied the deft touch to steer it into the far corner. ‘It’s fantastic to score in a game like this when the pressure is high. We knocked on the door throughout and we were lucky enough to get it in the end,’ Harrison said, after Leeds opened up a three-point buffer with four matches remaining. In the home dressing room, Leeds players had listened to radio reports pre kick-off of the late drama at Bramall Lane that saw Millwall squander a late penalty and then equalise deep into injury time. Confirmation of the 1-1 draw was greeted raucously in the stands at around the time Leeds suffered a set-back of their own – the loss of Liam Cooper to a muscle strain incurred in the warm-up. It did not inhibit them, however, as Gaetano Berardi – a full-back by trade – slotted seamlessly into the centre of defence. A total of 28 shots on goal was an indicator of their superiority over a team that had previously lost just once in 13 league matches under Steve Bruce. ‘We didn’t do enough but sometimes you have to credit the opposition. To be fair to Leeds that’s the third time I have seen them and they look a very good bet to go up,’ Bruce said. As someone with four promotions from this division, Bruce is well qualified to assess what successful teams look like at this stage of a season, although his opposite numbest Bielsa played down the significance of the position. ‘There are 12 points to play for and we only have three points difference over them,’ he said. The danger for Leeds was that their revamped backline would be susceptible to a Wednesday side with the goalscoring pedigree of Hooper and Steven Fletcher up top, and they were given a stark reminder of the threat just after the quarter hour when the former found his way through the middle and around the advancing Kiko Casilla only to hit the side netting from a diminishing angle after stand-in captain Luke Ayling forced him wide. At the other end, Westwood had produced a clutch of outstanding saves: great reflexes diverted Tyler Roberts’ 13th-minute header over the top and a drive from the same player was parried to safety. In between, Harrison’s downward header was clawed around the post. When the Wednesday goalkeeper was finally beaten, the place erupted in the knowledge that 10 further points would guarantee top-flight football here in August.